It is fall and everything is pumpkin. 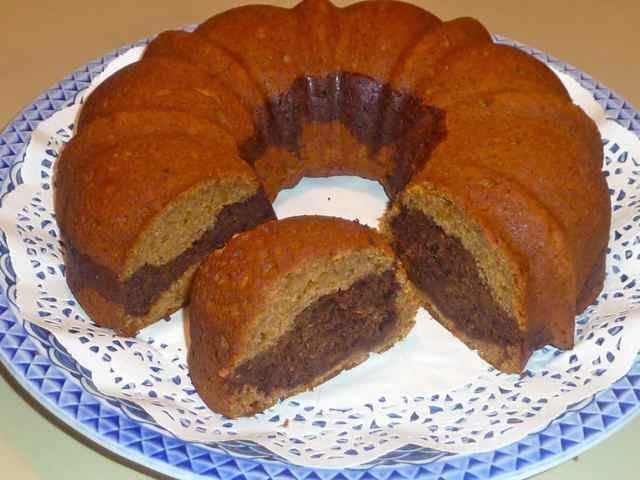 For me, most things are better with chocolate, so I made a pumpkin and chocolate cake. 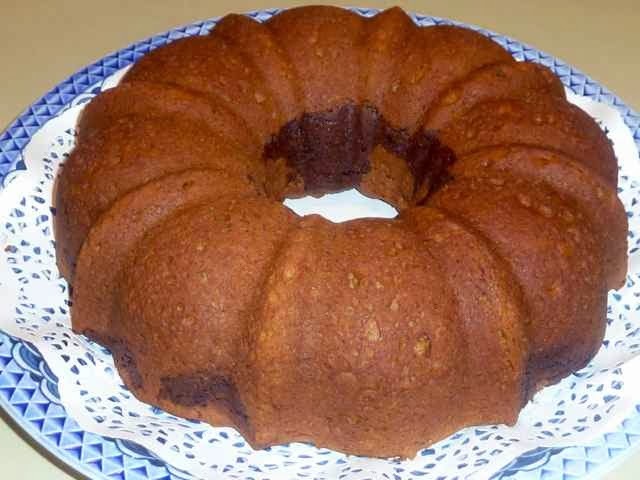 This cake is moist, soft and delicious. 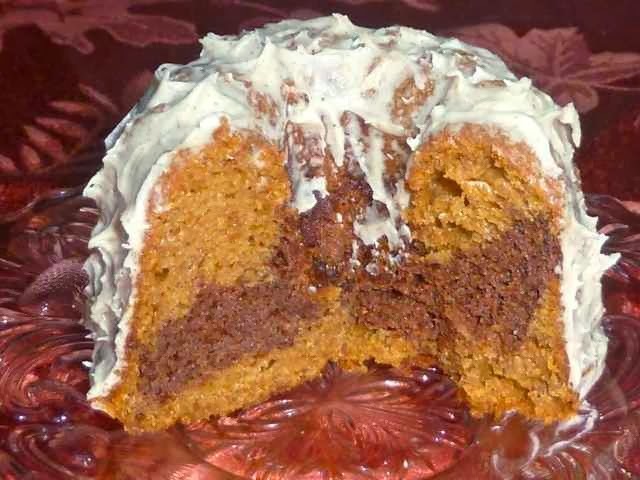 The spices are delicate and flavorful in both the pumpkin and chocolate parts of the cake. I converted a traditional recipe that I found on The Happy Housewife blog into gluten free. 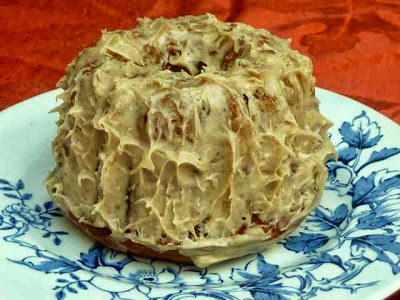 I love the texture of the gf version, it is just like a regular bundt cake. To my surprise and delight, replacing two thirds of the fat with applesauce lowered the calories without losing any of the taste or affecting the texture. I also reduced the sugar to make it just the right sweetness for my tastebuds. I tweaked the spices a bit too. The cake was served plain to rave reviews and everyone ‘had to have’ (at least) two slices. I decided to make it again and experiment with various frostings and also to play around with my new cupcake surprise pan. 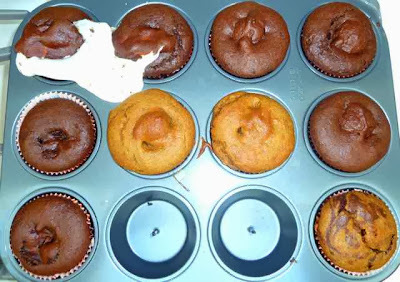 The surprise pan has spikes in the middle of each cupcake mold. The spike holds a treat in the center of the batter so it won’t float up or down during baking. Surprise pan with paper liners. First a little batter is put in the bottom of each cup. Then a candy or item of choice is put on the spike. 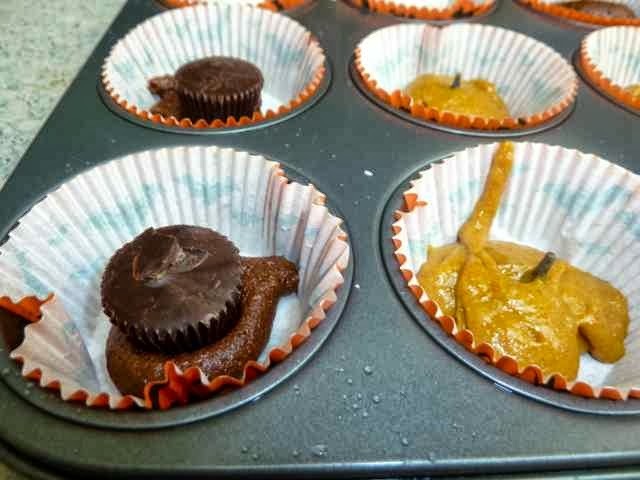 Here there are peanut butter cups. 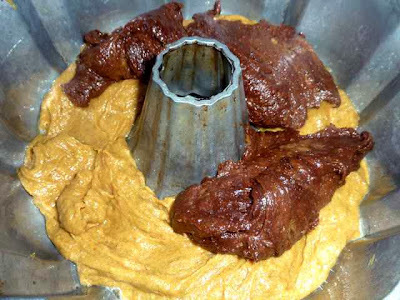 The rest of the batter is added on the top. I made small cake pop balls, some pumpkin and some chocolate. 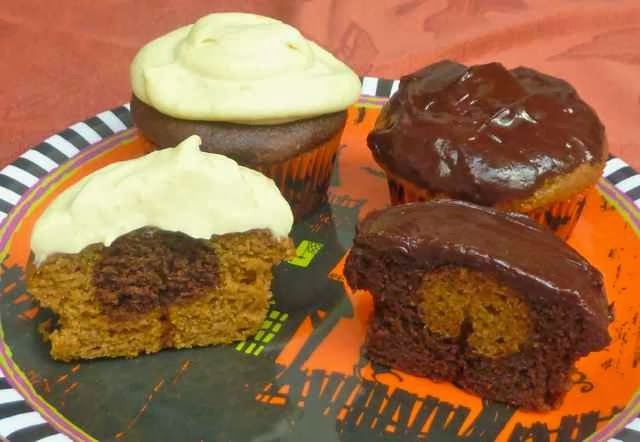 I put the chocolate ball in the center of pumpkin batter and the pumpkin ball into the chocolate batter, the aim was to see if it made a polka dot cupcake. It did. 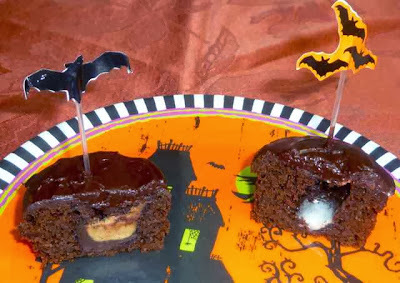 A chocolate cake ball in pumpkin batter. On the right a cake ball is all covered. In the front are pumpkin cake balls covered in chocolate batter. Cupcakes with cake ball polka dots inside. On the left cupcakes have Orange Cream Cheese Frosting. On the right is Chocolate Glaze. I also made some chocolate batter cupcakes with peanut butter cups and some with marshmallows inside. The marshmallow oozed out of both cupcakes and left a hollow marshmallow coated hole. Surprise cupcakes. On left with a peanut butter cup. On right with marshmallow that has mostly oozed out. Won’t be using the marshmallows again. The surprise cupcakes after being baked. Note the marshmallow ooze. There was enough batter left to make 4 small bundt cakes and each was frosted with a different icing. 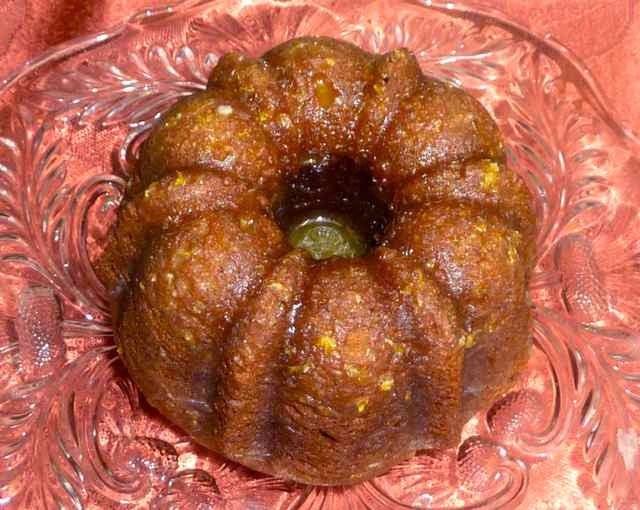 Mini Bundt cake with Orange Glaze. Orange Cream Cheese Frosting and Brown Butter Frosting. Mini Bundt cake with Brown Butter Frosting. Note the retro 'stucco' affect. They all go really well with the cake. My favorite is the Orange Cream Cheese one, but the Orange and Chocolate glazes were a close second. 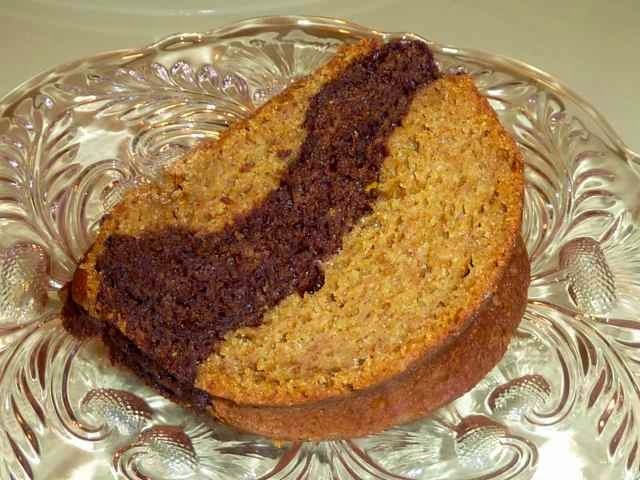 The orange flavor goes really well with the pumpkin chocolate spice cake. 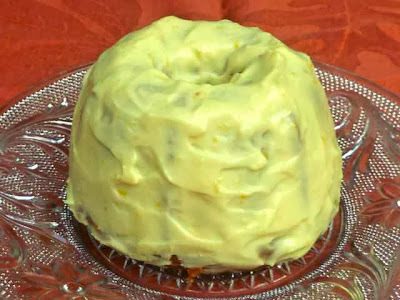 A chocolate coated cake topped with a thickened orange glaze will be my next experiment. Makes one bundt cake or 10-12 mini bundt cakes or 18-24 cupcakes. Preheat oven to 350 degrees. Grease a 12 cup bundt pan, or mini bundt pans. 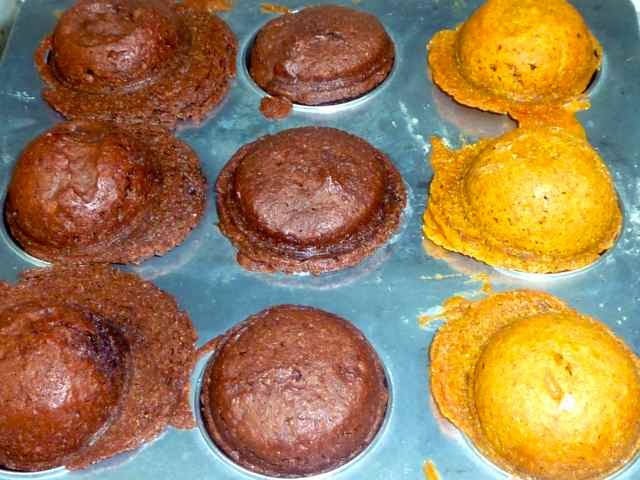 For cup cakes use paper liners. Add the flours, baking soda, baking powder, xanthan gum, salt and spices in a large bowl and stir with a whisk until well mixed. In a separate bowl add the sugars, oil or melted butter, pumpkin, eggs, vanilla and milk and mix together well until smooth. Add the wet ingredients into the dry ones and mix until well combined. Set the melted chips aside and allow the hot chocolate to cool off before using (so you don’t cook the batter). 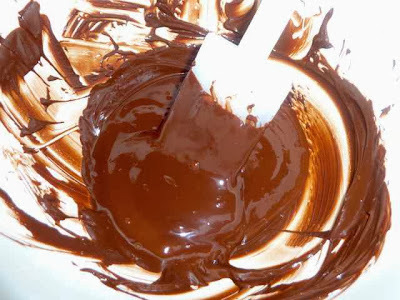 Place half the batter in a bowl and add the chocolate. (If you melted the chocolate in a bowl in the microwave or over hot water you can add half the batter to the cooled off chocolate in the bowl. Just saying, saves washing another bowl.) Mix until well blended. Pour half of the plain pumpkin batter into the pan. Then pour all the chocolate batter on top. Pour the remaining plain pumpkin batter on top. The original directions said to give the pan a few good twists to mix the batter. This will result in three well separated layers of cake. 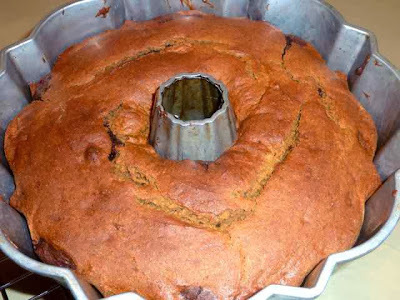 If you want it to look more like a marble cake, run a knife through the batter several times going all around the cake. starting to add chocolate batter on top. Bake for about 50 minutes or until the the cake springs back when gently pressed with a finger tip or until the center of the cake is 210 degrees. I found that a cake tester would not come out clean, even when done so I used a thermometer. In my oven it took about 55-60 minutes. The small bundt cakes took 30 minutes and the cupcakes took 25 minutes. Cake balls in a cake pop pan. Use a kitchen shears to trim the edges. The cake balls took 30 minutes. Baking times will vary according to your oven so set a timer to 10 minutes less than suggested times and check for doneness. Return the cakes to the oven for more baking if needed. Cool cakes in the bundt pans for 10 minutes before turning them out onto a rack to cool completely. This helps to prevent the cake from sticking to the pan. 16 oz. Cream Cheese - for Dairy Free use non-dairy cream cheese. 2 Tbs. (to 4 Tbs.) Orange Juice - add more if needed to get the right consistency. Add all the ingredients to a bowl and mix together with an electric hand mixer until creamy, light and fluffy. If too thin add more powdered sugar a Tbs. at a time; if too thick add some orange juice a tsp. at a time until you achieve the desired consistency. The inside of a Mini Bundt cake. GLUTEN FREE CHOCOLATE & PUMPKIN SPICE SWIRL CAKE Makes one bundt cake or 10-12 mini bundt cakes or 18-24 cupcakes. Ingredients 1 1/4 cup Sorghum Flour 1/2 cup + 2 Tbs. Tapioca Flour 1/2 cup + 2 Tbs. Chickpea Flour 1 tsp. Xanthan Gum 1 1/2 tsp. Baking Powder 1 tsp. Baking Soda 1/2 tsp. Sea Salt 2 tsp. Cinnamon (ground) 1/2 tsp. Ginger (powdered) 1/4 tsp. Cloves (ground) 1/8 tsp. Nutmeg (ground or freshly grated) 1/2 cup Applesauce 1/4 cup Melted Unsalted Butter or for Dairy Free use Oil (I used Extra Virgin Olive Oil.) 3/4 cup Sugar (I used evaporated cane juice crystals.) 1/2 cup Brown Sugar (I used evaporated cane juice crystals.) 2 tsp. Vanilla (I used 1 tsp. vanilla extract and 1 tsp. Butter Vanilla-Lorann Brand.) 2 large Eggs 1 15-ounce can Pumpkin Puree (NOT pumpkin pie filling) 1/3 cup Milk - For Dairy Free use nondairy milk (I used unsweetened Coconut Milk.) 1 cup Semi-Sweet Chocolate Chips (For Dairy Free use dairy free chips.) Directions Preheat oven to 350 degrees. Grease a 12 cup bundt pan, or mini bundt pans. For cup cakes use paper liners. 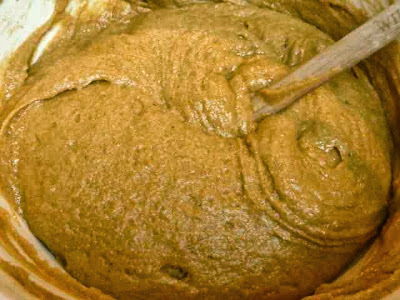 Add the flours, baking soda, baking powder, xanthan gum, salt and spices in a large bowl and stir with a whisk until well mixed. In a separate bowl add the sugars, oil or melted butter, pumpkin, eggs, vanilla and milk and mix together well until smooth. Add the wet ingredients into the dry ones and mix until well combined. Melt the chocolate chips. (I put them in a microwavable bowl and melted the chips in the microwave. I ran the microwave at 30 second intervals and stirred each time. It took about 2 minutes in my oven. You can also melt them in a bowl over hot water or stir them constantly and melt them in a saucepan.) Set the melted chips aside and allow the hot chocolate to cool off before using (so you don’t cook the batter). Place half the batter in a bowl and add the chocolate. (If you melted the chocolate in a bowl in the microwave or over hot water you can add half the batter to the cooled off chocolate in the bowl.) Mix until well blended. Pour half of the plain pumpkin batter into the pan. Then pour all the chocolate batter on top. Pour the remaining plain pumpkin batter on top. The original directions said to give the pan a few good twists to mix the batter. This will result in three well separated layers of cake. If you want it to look more like a marble cake, run a knife through the batter several times going all around the cake. Bake for about 50 minutes or until the the cake springs back when gently pressed with a finger tip or until the center of the cake is 210 degrees. I found that a cake tester would not come out clean, even when done so I used a thermometer. In my oven it took about 55-60 minutes. The small bundt cakes took 30 minutes and the cupcakes took 25 minutes. The cake balls took 30 minutes. Baking times will vary according to your oven so set a timer to 10 minutes less than suggested times and check for doneness. 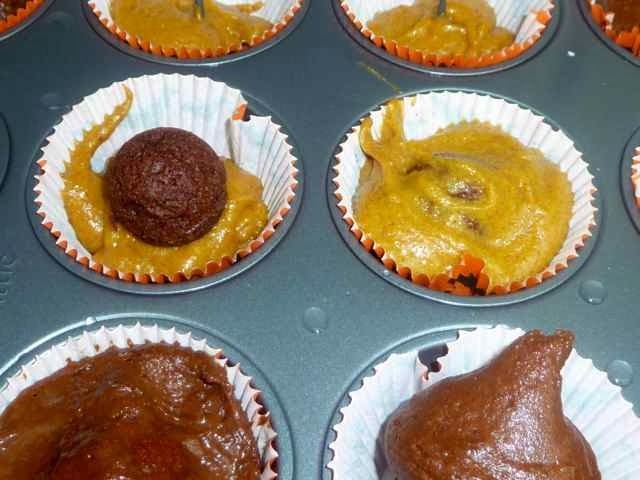 Return the cakes to the oven for more baking if needed. Cool cakes in the bundt pans for 10 minutes before turning them out onto a rack to cool completely. ORANGE CREAM CHEESE FROSTING Instructions 16 oz. Cream Cheese - for Dairy Free use non-dairy cream cheese. 4 Tbs. Unsalted Butter - for Dairy Free use margarine 1 cup Confectioners Sugar 1 tsp. Orange Extract (or to taste) 1 tsp. Orange Zest 2 Tbs. (to 4 Tbs.) Orange Juice - add more if needed to get the right consistency. Directions Add all the ingredients to a bowl and mix together with an electric hand mixer until creamy, light and fluffy. If too thin add more powdered sugar a Tbs. at a time; if too thick add some orange juice a tsp. at a time until you achieve the desired consistency. Frost cake.